Romola Butalia met Amitabh Bachchan to discover the human face behind the larger than life image. I hate not having concise directions to a place where I have an appointment, and I was unfamiliar with the residential areas of Mumbai. So I asked Bachchan for directions to his residence - he gave me the landmark of a temple. Reaching Juhu, I was unable to trace the temple, despite asking several people. Finally, I explained to the three-wheeler driver that Amitabh Bachchan lives opposite the temple. He looked at me as though I must have lost it, explaining that I should have given Bachchan's house as the landmark if I wanted to go to the temple. Now he took me straight to the temple, while pointing out the house where Bachchan lives. Switching off his engine, he waited for me to enter the temple. He had already counted his return fare - after all, how long does anyone spend in a temple ? I was dropped off at the temple gate. I hesitated crossing the road to Bachchan's house with the driver watching me in amusement, assuming I had forgotten at which god's door I had wanted to offer worship. At that time, crowds still jostled with each other outside Bachchan's house to pay obeisance hoping for a glimpse of the star. I marched across the road. I did not want to be late for my appointment. 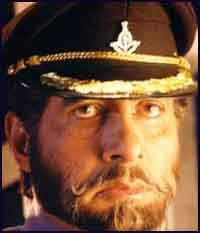 I am a stickler for punctuality, and Bachchan's own professionalism and distaste for tardiness was legendary. He was also not fond of the media. Besides I knew he was a tough nut to crack. While some people introspect with ease, others have worn their armour so long, they will never meet anyone unarmed. I gave the guard my name, since I rarely carry a visiting card - scribbled it on a paper fished out of my notepad, and waited patiently, while the auto-driver tuned his vehicle around to park it in front of me, so he could drive me back to wherever I had come from, now that we both knew it was not the temple I had come for darshan of. The gate moved on it's well-oiled hinges and let me in. From the corner of my eye, I could see the auto-driver's jaw fall open as I entered the hallowed grounds of Bachchan's house. I entered the office and announced myself to his old-time trusted secretary. Bachchan soon arrived in kurta-pajama, greeted me with punctilious professional haste, and led me to what can only have been his TV-watching room. A huge screen faced us, as I posed questions to be regaled by one-line uncommunicative answers, with Bachchan glancing at his watch with rarely concealed impatience. Minutes later, fiddling with the remote, he put on the channel with a live telecast of an India-Pakistan cricket match, and between watching the ball, shut the TV off to answer me. I knew my time was up - I already knew the number of minutes he gave directors and script-writers who had come to tell him the story-line of a film. I had already been told that he makes you aware that every second of his time is weighed in gold. But, in all fairness, it must be added that I have spoken to several film-makers who have worked with him, from his very first film as an unknown entrant, till the sad tail-end of his career. Be it Prakash Mehra, who reminesced about the premiere of Bachchan's first film and his subsequent rise to the status of a super-hero, or the late Mukul Anand who directed him in several films before his sabbatical or Rakesh Mehra who made the two music videos of Bachchan, everyone had sworn about his sheer professionalism, about the fact that he is a delight to direct. As a director's actor, he will try anything suggested to him, even if he warns, "this one won't work, but you are the boss." 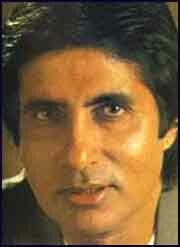 Bachchan never subtracts from a film. It is a pity that he was not allowed to mature as an actor, whether because of his image as the angry young man, or because mainstream Hindi film directors, working on a failsafe formula, rarely bother with the skills involved to make the actor feel and emote the role he is portraying. Which is why the type-casting of actors to play stereotypical roles. I nervously worried that I did not have a para's worth of a story to write on him - I was still fumbling for the ice-breaker to 'reach' him. By the time I left, for possibly the only time in my life that I have done an interview with someone, I knew that not a moment of anything worth it had been said at all. At the office, the editor asked me what kind of a story I had. I said, "It works because it's Amitabh Bachchan - otherwise he said nothing at all." The title was a quote: "I'd like to be in your shoes" Well, that was the only thing I remember him saying all these years later. And that sentence made good copy. So what did he say, after all? When he met me, he extended his hand, and said quite unneccesarily, "I'm Amitabh." Was that his natural unassuming style - in which case, here was another human being behind an actor. But I never saw the human being long enough to be sure whether or not everything he does is with studied effect. In which case, I thought, what an actor! Bachchan's films had been pure entertainment - on screen he was always the hero of the masses, and he managed to reduce the most critical viewer to non-critical audience with infectious delight. His timing was always perfect, and his ability to express humour with delightful mocking understatement or delicious exaggeration had endeared him in his films. But I was not writing about the actor. I had a peg to the article on the super-hero, even if he was fencing every inoffensive question I asked. I was doing a series of stories on how people at the top of their professions handle stress, about their definitions of failure and success. It was about the assessment of their strengths and weaknesses. Bachchan had probably dealt with stress so long, he was not about to concede to sitting under the open glare of publicity with one inch of himself exposed. So when I asked him, if he would do anything differently in his life, he quipped, "Next time round, I'd like to be in your shoes, asking all the questions." Next moment his eyes and mind were again glued to the TV. I had been with him 40 minutes already. I could not return without a story. I asked him if he felt defensive of his personal space. Leaning forward to hear his reply above the roar of cricket enthusiasts at the stadium, I dropped my bag. With obvious sarcasm he said, "I'm not the one who is nervous." His eyes darted to the TV again. I already knew that substance was not the criteria for readability when it came to Bachchan. His face and name were the unique selling point of one who rarely gave interviews. When I stood to leave, Bachchan could not have ushered me out of the room faster than he did. Yet, the perfect gentleman that he is, he walked past the lawn and saw me off to the gate. He stood in the hot summer sun, shaking hands warmly, smiling pleasantly, suddenly in no hurry at all. I understood what he meant when he said of the things he enjoyed doing, "I enjoy normal every day things like a walk in the park." Was it a sad reflection of what life as a super-hero is, that he had to qualify it with, "A walk in the park in those parts of the world where I can do it unnoticed." I looked at the high walls surrounding us, at the uniformed guards. I looked at my own mud-splattered walking shoes, and wondered if he had only been facetious about exchanging shoes. Was it then only rationalisation that had prompted him to say, "When you start off you crave recognition, so when you finally get it, it would hardly be fair to say you seek anonymity."